There comes a time during the day when I get so ravenous that a piece of fruit or handful of nuts won't satisfy my stomach. The aching feeling of hunger creeps up on me slowly, a hollow chasm that grows larger and larger until I have to eat something. You know that feeling of a persistent, begrudging hunger? The one that won't disappear unless you eat a big meal? I get that at around 11am on a weekday, and it's a feeling I often feel guilty fulfilling, wanting to wait until lunchtime to eat my proper lunch. I get scared that I'll get myself full before I'm meant to, at a time in the day that you're not meant to get hungry. Some may say you should have a bigger breakfast, but what if I've had one that has made me stuffed but am still hungry when it comes to the mid-morning munchies? I've read about these healthy date snacks everywhere under the guise of a range of different names - Larabars, Energy Bars, Protein Balls - but essentially they're all made up of the same base of processed dates and nuts, just flavoured and shaped in different ways. They're raw, gluten free and good for you in all different ways, and only require a small amount of ingredients and effort to make. They make a perfect portable snack that will fill you up when you're feeling hungry, and are jam-packed full of good nutrients that nourish and replenish you when snacking time arrives. Browsing the internet I found heaps of recipes for these date and nut balls, but found that they were often too date-y or required copious amounts of ingredients. 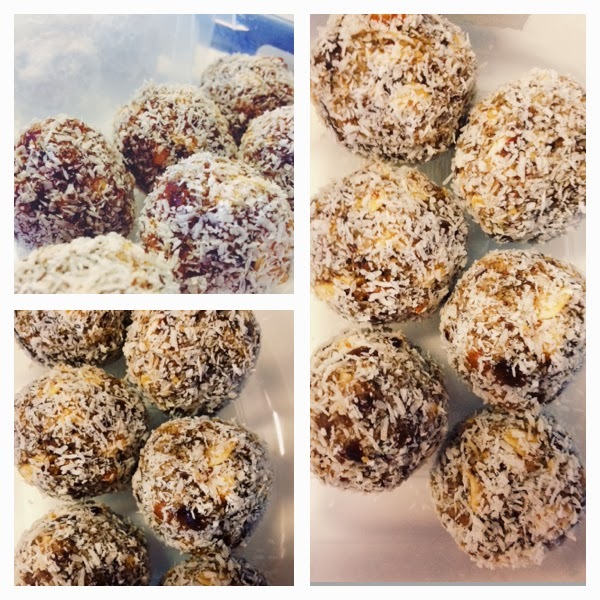 This one I've adapted below from a recipe I found for Coconut Almond Date Balls on The Happiness In Health, tweaking little bits here and there to get the flavour and consistency I was looking for. These ones have a chunkier consistency so that you can see and feel all the different ingredients, and are slightly more sour thanks to the addition of dried cranberries. Really, you can add whatever flavours you like to them: cocoa, peanuts, hazelnuts, apricots... the possibilities are endless. You can even make double the batch and freeze some for later on - I find they're just fabulous taken out from the freezer in the morning and left to defrost in the lunchbox for a perfect mid-morning snack. What I've given below in terms of ingredients is just a guide, a foundation upon which you can build. Go crazy! Process dates and water in a food processor or blender until a smooth paste is formed. Mix in remaining ingredients with a spoon. Take heaped teaspoons of mixture and shape into balls using hands. Roll in coconut. Place in an airtight container and refrigerate or freeze until ready to eat.